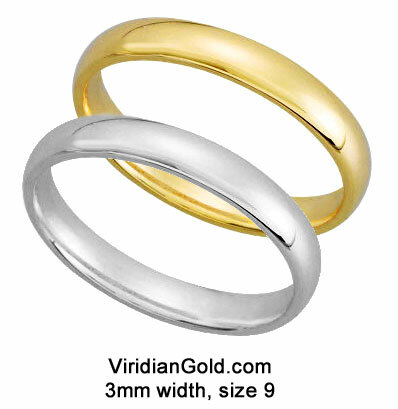 You will notice at Viridian Gold that our rings are available in sizes. Many jewelry websites will sell you a ring, but in an unspecified size, and it's easy and cheap for them since they don't have to do any work! You see, rings are manufactured in non-exact sizes--usually around a size 6 or 7 for a woman's style ring, and 10 or 11 for a man's style ring. 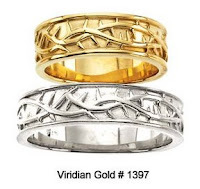 At our store, some rings are stocked in whole and/or half sizes, such as the first row of our Gold Wedding Bands page, and some are also available in sizes, or "unsized", meaning the ring is just like what "the other guys" sell, as described above (like the Crown of Thorns Wedding Band #1397, on the second row of that page). 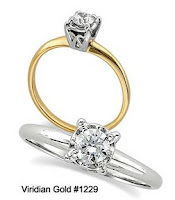 The bottom line is that we size the ring for you, and our charge for that varies depending on the ring size and style. So, our rings will show a drop-down menu in which you select the ring size--the added cost for sizing, if any, is shown in parentheses, such as (+24), which means that $24.00 will be added to the cost of the ring when it is put in the shopping cart (when you click the "buy now" button). We can have the rings sized in other increments, such as the 7 1/8 size which one customer recently requested. Just let us know in the comments section of the order page, or call us, or send us an email with instructions.